Boston's first Apple flagship store is coming soon to the Back Bay - a smooth, clear jewel box of a building - and it promises to be the Hub's most exciting piece of retail architecture in years. Its arrival shows that Boston wants contemporary design to blend in with the historic. But there may be a flaw - not in Apple's vision, but in the city's. When Apples new boston flagship store opens its doors at 815 Boylston Street later this year, expect mania. Apple devotees, known for their fierce brand loyalty, approach store openings with the fervor of rock groupies. When a San Francisco flagship store opened in 2004, there were 1,200 people in line, many of whom had camped overnight. Last year, thousands attended the opening of New Yorks Fifth Avenue store, where the companys iconic logo was seen painted on womens cheeks and shaved into the back of one boys head. When this big Apple circus arrives in the staid Back Bay (the store could open by December), the people streaming in will see up close just how big a role a building can play in enhancing a brand. The shop represents the most exciting piece of retail architecture in the city since Frank Gehry renovated the Tower Records building on Newbury Street in 1989. Apples flagship stores, which are changing the way people think about retail, dont just cater to shoppers, they cultivate a social experience  and this store, like the others, is designed to draw a crowd. But it will be much more than that. The building makes a statement about the city. Boston isnt yet fully embracing contemporary architecture, but the stores arrival shows the city is willing to experiment with it. Its one thing to put a gorgeously innovative building such as the Institute of Contemporary Art down on the waterfront, where theres a clean slate; its far riskier to put an unapologetically modern building in the historic Back Bay, not far from the neighborhoods Victorian town houses and Gothic Revival columns. That juxtaposition  innovation amid preservation  is part of an overall architectural philosophy thats taking shape among city planners, who worked with Apple officials to scale back their boldly modern design so the store would fit in better with neighboring buildings. But how far this approach should go  namely, how to temper the contemporary so it complements the historic  is stirring debate. And as the citys wave of new architecture continues, the most significant issue for officials to ponder, particularly for retail space, may not be how to blend the new with the old, but whether the new should be required to blend in at all. Unlike your average Apple store, such as the ones at the CambridgeSide Galleria and the Chestnut Hill mall, the flagship store on Boylston is expected to offer numerous activities for shoppers. The company wont discuss final details, but some of the plans described by the Boston Redevelopment Authority and some features at other flagship stores provide clues. For starters, theres likely to be free wireless, so visitors can check e-mail and surf the Web. After browsing products on the first floor, customers can ascend the seductive glass staircase to the second floor  where they can peruse more gadgetry and may be able to attend demonstrations on a variety of subjects. The third floor could offer free retail services, including a Genius Bar, where an expert would be on hand to help solve tech problems. Hands-on experience will be encouraged throughout the store; computers will be hooked up to digital cameras and camcorders, for example, so shoppers can get a feel for hardware and software. 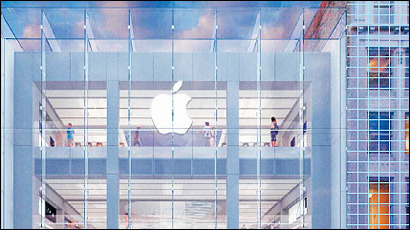 Like an iPod, iBook, or the recently unveiled iPhone, the 21,350-square-foot store itself  its hard to resist calling it an iBuilding  will be all about innovation, streamlined design, and easy navigation, from the overall layout to the most minute detail. Style, after all, plays a key role in how Apple connotes brand. In this way, the entire building, designed by the San Francisco office of the acclaimed firm Bohlin Cywinski Jackson, will function like one giant logo. An eco-friendly roof will be blanketed with hardy vegetation designed to insulate the building in winter and keep it cool in summer. The buildings facade will consist of a series of glass panels that will stand 7 to 8 feet in front of its basic structure, a grid of two horizontal slabs intersected by two columns, all finished with matte stainless steel. The panels will feature low-iron laminated glass, which appears more lucent and doesnt exhibit the faint blue or green hue of regular glass. It didnt come without conflict. Apple Inc., based in Cupertino, California, had to fight for that opportunity. First, there was the question of the existing building at 815 Boylston  a two-story 1906 structure, which most recently housed a Copy Cop. Last August, the Back Bay Architectural Commission agreed that the nondescript building was not architecturally significant and granted Apple the right to demolish it. The next hurdle came when the BBAC asked Apples architects to rework the initial design  which was even more minimal than the current one  so that it would be more harmonious with the flanking circa-1900 buildings. In the revised design, which the commission ultimately approved 6 to 3, Apple added the columns so the building would mirror the vertical aesthetic of its neighbors. At least one key player in the decision seems fine with that possibility. In the first six months, [the building] will stand out, Menino says. Then it will blend right in, just like the  State Street building did, he says, referring to the downtown office tower completed in 1988. Still, some may ask: Is that what we really want? The new Apple store joins a long list of contemporary buildings in Boston being designed by a whos who of architects. In addition to the new ICA on Fan Pier, we have welcomed in recent years Rafael Vinolys adventurous 2004 convention center on the waterfront and the buildings of Frank Gehry and Steven Holl at the Massachusetts Institute of Technology. Moshe Safdie and Daniel Libeskind are slated to build new museums on the Rose Kennedy Greenway. Norman Foster is building an extension at the Museum of Fine Arts, and Renzo Piano has designed an addition for the Isabella Stewart Gardner Museum and submitted a design for the 1,000-foot tower that Menino hopes will soon pierce our skyline. But exactly how this Boston style will be implemented in the future raises questions. The BBACs quest for architectural continuity might be justified on Newbury Street, which has a much richer and more consistent historical appearance. Yet, on a lackluster stretch of Boylston Street that already hosts a hodgepodge of historical styles, the desire to have a contemporary building blend in with a century-old aesthetic seems less relevant. William Young, the BBACs senior preservation planner, thought the initial design would have stuck out like a missing tooth on Boylston Street. But a more spare building would have been bolder  and a better stylistic foil for the adjacent buildings. The approved design still promises a handsome contemporary building, but by adding the columns and thus creating a grid pattern, the spare elegance of the initial Apple design is sadly lost. If a building is allowed to have its own voice, it can only enhance buildings around it, says Nader Tehrani. When you resort to this pastiche and mimicry [of historical style], you destroy the meaning of the real historical fabric around you. If Boston aspires to uphold its historical place, it needs to acknowledge new methods of construction and design. Doing this, he adds, will reinforce a larger sense of history by reflecting the citys many distinct eras and styles, instead of just one monolithic idea of the past. For an example of historical pastiche, look no further than the designs for the Mandarin Oriental Hotel complex, currently under construction across the street from 815 Boylston. A postmodern building with vaguely Art Deco lines, its not unattractive, and its certainly an improvement over, say, the faux historical Hotel Commonwealth in Kenmore Square. Yet, the Mandarin Oriental is not striking. Its simply safe. Ironically, it is perhaps because Boston is so blessed with a rich architectural history that we cannot see beyond it. We often let our beloved brick buildings define us completely  whereas in European cities with architectural histories much longer and richer than ours (Berlin comes to mind), daring contemporary designs create a dynamic panoply of style. Theres little doubt this shiny new retail temple will woo the masses  Apple cultists, camera-toting archi-tourists, and the general public alike. And although it may seem silly to get worked up over a gadget shop coming to town, this Apple store marks an important architectural step forward for Boston. Sure, there are still those who would like to preserve the Back Bay like a mosquito trapped in amber. But the BBAC-approved design, though somewhat watered down from the original, still promises an exciting contemporary building that will inject Boylston Street with some much-needed panache. The old-versus-new debate the store is generating is welcome. No one is saying a developer or architect should be able to plop down a building without input from the city. But the store just may prove that good design in a historic area does not have to be traditional, and persuade skeptics that, at least sometimes, its good for contemporary architecture to stand out among its elder neighbors  not merely blend in with the crowd. Rachel Strutt is a Somerville-based freelance arts journalist. E-mail her at rachelstrutt@yahoo.com.